Dealing With IRS Tax Debt and Need Relief? You have options. Tucson tax attorney Sheldon Lazarow provides tax help to individuals and business owners. "They are the best at what they do and would recommend them to everyone with a tax problem. Lazarow Law I can't thank you enough." "For anyone that is looking for a great lawyer this is your man...Mr. Lazarow is the greatest and so wished we would of found him years ago...."
"Mr. Lazarow's fees are very reasonable. We consider ourselves fortunate to have discovered Lazarow Law, and recommend this law firm to anyone who needs help with IRS problems. "I was tempted to just pay the IRS. Mr. Lazarow resolved the entire matter and I did not have to pay the IRS anything at all." "Discover How You Can Stop IRS Tax Collectors Cold!" We know how stressful this is for you and your family. When the IRS starts tax collection activities many people just like you are overcome with fear, anxiety and stress. All you really want is for somebody to take away your stress and worry and give you back your life. Look, the IRS is the most powerful arm of the United States government. They do business by using the tools of fear and intimidation. IRS tax collectors are not your friends. The IRS does not advise you to do what is best for you. All they want is their money and, if you do not have protection, they will get it, even if they have to take it from you! The IRS really doesn't care about you or your family and don't let anybody tell you they do. You have a problem and you know you must reach out to someone for help. But, who? 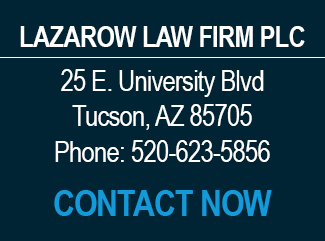 Sheldon Lazarow, an experienced Tucson, AZ IRS tax debt attorney, heads the firm. We have seen individuals from all walks of life and businesses that have been hounded unmercifully by the IRS. We have guided them to a complete resolution of their problems so they could start fresh, new lives. It is all that we do – protect people and businesses from the IRS. With a thorough knowledge of the law and many years of experience we know that there is always a tax remedy available for everybody. Every case is different. Some are harder than others. Some take longer than others. Some are, frankly, more expensive than others. But, with knowledge and experience they all can be solved. You can talk to us for free to see if we are a good fit to work together. We know that many people are nervous about talking to a lawyer. Some people also think that a lawyer is unaffordable. Well, you may be surprised. Look, that's why we provide a free consultation so you can see if you feel comfortable working with us and to get your questions answered. Grab your free consultation now. What do you have to lose? When you get rid of the IRS it will feel like a huge weight has been lifted off your shoulders. You will be able to breathe again. You will be able to sleep again. You will live your life freely without always having to look over your shoulder. In fact, you may not have to wait for these kinds of feelings. Many of our clients tell us they feel this way after their first meeting with us. Our guidance doesn't stop with just helping you solve your tax problem. We also will help guide you to avoid ever having the problem again. Go Ahead, Call or Contact Us Now! You Won't Be Sorry.